More than 20 years ago, David Eltis and David Richardson decided to combine their studies of the trans-Atlantic slave trade and their data collection efforts into one database, which they posted on the internet. 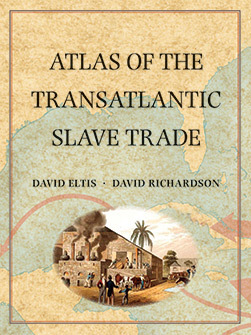 This groundbreaking work became the website www.SlaveVoyages.org and evolved into the publication of Atlas of the Transatlantic Slave Trade (Yale University Press, 2010), a narrative with more than 200 maps. The atlas has won a series of prizes, including the 2010 R.R. Hawkins Award, given by the Association of American Publishers. Eltis is Robert W. Woodruff Professor of History at Emory University. He is the author of The Rise of African Slavery in the Americas (2000), which was awarded the Frederick Douglass Prize, the John Ben Snow Prize, and the Wesley-Logan Prize. A graduate of Durham University, he holds a doctorate from the University of Rochester. Richardson is director of the Wilberforce Institute for the Study of Slavery and Emancipation and professor of economic history at Hull University in England. He holds a master’s degree from the University of Manchester.